Mt Buller and Mt Stirling sparkle in winter, blanketed with snow on their peaks. Don hats and gloves and head out to explore a magic day of snow-shoeing, tobogganing or a scenic chairlift ride. 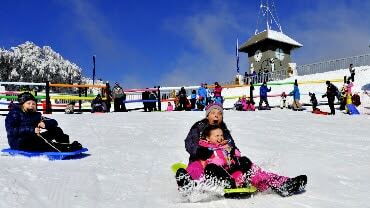 Winter is a great time for kids in Mansfield Mt Buller, and you don't have to snowboard or ski to have fun. View Mt Buller's first timers guide. Make your own snowman, have a snowball fight, toboggan down a gentle slope and when you've got rosy cheeks, head inside for a frothing hot chocolate - marshmallows optional. With Mt Buller's "Kids Stay Free" offer in June and September, a family snow experience has never been easier or more affordable. Big and little kids will enjoy the simple fun of sailing down a white slope on a toboggan! Hire a toboggan and head to the toboggan run. Be sure to sit or kneel on the toboggan, never head first or standing up. Make sure the path is clear, and if you fall off the toboggan, quickly move out the way. The same goes for when you have finished your run, quickly move out the way and walk back up on the sides of the run, not up the slope itself. Mt Buller has two designated toboggan areas – one in the day car park and one next to the Post Office in the village. For safety, only toboggan in the designated areas. View the Mt Buller Village map and the Mt Stirling map. If you can walk, you can snowshoe! It’s easy to learn, like walking with a quick rhythmic pace. Nothing is quite as special as snowshoeing through an alpine forest in the snow. 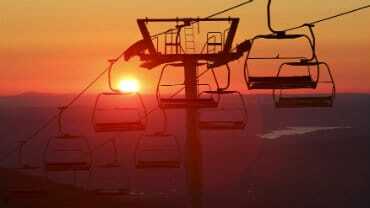 Why not watch the sun go down from the Mt Buller summit or explore the tranquil trails at Mt Stirling. Suitable for all ages, and a great way to enjoy the snow. You can hire your gear or book a guided tour. 1. Check the Wheel Chain Declaration - Carry wheel chains and fit them as instructed. 2. Purchase your resort entry pass online, or in person at Mirimbah Resort Entry. 3. Waterproof clothing (jacket and pants), gloves and hats. 4. Sunscreen - The snow reflects strong UV rays. 5. Waterproof and warm boots. 6. Change of clothes for the kids - and a plastic bag to put the wet snow clothes in! 7. Camera or smart phone to snap those happy memories! 8. Anti freeze and alpine diesel. Jump on the Northside Express from the visitor day park at Mt Buller and you’ll be treated to a beautiful ride across some of Mt Buller’s slopes. Tickets are available from any ticket office or Buller Sports outlet. You know you want to! Tradition dictates a carrot for the nose, but pebbles or gumnuts are a good substitute. 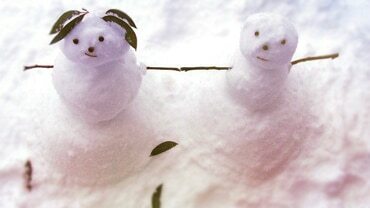 Twigs for arms and some gum leaves for hair, gives your snowman an authentic “Aussie” touch! Be as creative as you like, with a scarf or hat to finish off. Take a photo and tag #mansfieldmtbuller to share! Daggy, but irresistible! Make sure you find a spot away from walking traffic and ski runs, somewhere with a good cover of snow. Lie down, swish you arms and legs in and out: stand up and there you have it – your very own snow angel. Find a cosy bar, cuddle up by a frosty window and indulge yourself in a frothy hot chocolate – the original central heating! Why not go on a “hot chocolate crawl”, sampling hot chocolates across the region.